Roving Bandit: Is “technical assistance” counterproductive? Duncan Green reviews a fascinating new AidData survey on what developing country policymakers think about donors. "Reliance upon technical assistance undermines a development partner’s ability to shape and implement host government reform efforts. The share of official development assistance (ODA) allocated to technical assistance is negatively correlated with all three indicators of development partner performance." Obviously alarm-bells should be ringing about such firm causal conclusions being drawn from a correlation. One of the best ways of assessing these things is with some rigorous eyeball econometrics - take a look at this chart showing the relationship driving that claim. Looks to me like that is a pretty weak relationship, and you could just as easily have drawn a totally flat line (no relationship). And indeed, deep in the weeds, Table E.11 tell us that this is a simple correlation between these two variables with a sample size of just 44 data points (countries). It might technically pass a statistical significance test, but it doesn’t really tell us that there is a reliable correlation, let alone causality. 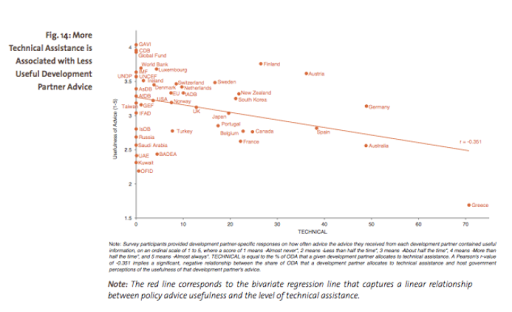 And even if you believed the estimated negative relationship - it’s really not huge - implicitly going from 0% aid on technical assistance to a massive 50% of aid spent on technical assistance would only reduce the perceived quality of your advice by 0.55 points on a 5 point scale. Bottom line for technical assisters - don’t give up your day job quite yet.